So, you’re thinking about adopting? ​If you are ready to adopt and want to start the process of becoming a new adoptive parent, please review our Adoption FAQ below and complete an Adoption Questionnaire for our review. You’ve come to the right place! Our furry friends come to us in a variety of ways – the streets/strays, owner surrenders, with most of them coming from our local shelters. Every animal brought in to the 4Life Family is given 100% from us to ensure they are healthy and happy. Like people, no two animals are the same. More often than not, when a new animal comes to us, it takes time to learn who they are, what they like (and who they like) and do not like. We do our best to learn the animals personality, get them on the right path with good manners and basic obedience training, and nurture and love them so their little personalities can shine. There is nothing quite like a happy, healthy, well behaved rescue pet! 1. Do you rent an apartment, house, condo etc? ​Find out if your landlord has breed/weight restrictions prior to adopting. 4Life, along with the majority of other animal rescues will verify this information. In addition, there is nothing more heartbreaking than seeing a shelter animal get adopted from an animal shelter and get returned because the person/family did not confirm that they are allowed to have a dog or a specific breed. This often also leads to these animals facing almost certain euthanasia when they are returned to the shelter. Please do your due diligence prior to adopting. 2. Do you own your home? Does your home owners insurance have any breed restrictions? Don’t let it deter you from adopting! This is great information to know in advance, but in the event your home owners insurance does have breed restrictions, there are other insurance companies that do not. You can find more information on home owners insurance here. 3. Are you prepared to set your new family member up for success? 4. Are you willing to invest in training? We do our best to work with our dogs prior to them being adopted; however, training is only successful if maintained. Are you willing to seek out training in the event your pet needs it? We strongly encourage training vs. returning a dog to a rescue or shelter. Sometimes all they need is a little guidance to get them on the right track. We know some amazing trainers! Please don’t hesitate to reach out for help. 5. Are you able and willing to invest in a dog financially? Owning pet always comes with a financial responsibility to care for them and keep them happy. Food, toys, training, treats, and medical bills can be costly. While there are ways to save money, all dogs need a financially stable family who can give them a bright future. For more information on cost and ideas for saving money, visit Coupon Chief. 6. Please note that we do not ever adopt pets out as a surprise or gift for a friend or family member. ​If there are multiple adults in the home, we must know that everyone is on board with the adoption. Please feel free to contact us at savealife@4liferescue.org if you have any adoption questions not listed here. ​We look forward to helping you find your perfect 4Life family member! Upon finalizing the adoption, you will need to pay a non-negotiable adoption donation fee. Adoption fees are necessary in order to recuperate the costs of caring for the animals. We are a 501(c)3 Non-Profit Organization so without adoption fees and generous donations and fundraising, we cannot continue to save lives. Below are some details on what these funds are used for. These costs will never be passed on to the adopting family, but your adoption fee will help us recover some of the cost. We strive to set all of our animals up for success 4Life! Some animals require us to bring in the help of dog trainers or even we may need to place some dogs in board & train programs to ensure they become the best family pet they can be. Click Here to complete our short online questionnaire. A member of our team will contact you within 48 hours with any questions we might have, or to discuss additional steps in the adoption process. A member of our team (typically this will be the pet's current foster parent) will contact you to set up a meet and greet. We will utilize this time to allow you to get to know the pet and determine if it is a good fit for your home. If there are other pets in the home, we require proper introduction of new pet in to the home with one of our rescue representatives. A member of our team will contact you to schedule a time to come visit your home. During the home visit, we will view your home so that we can ensure the home is suitable for a pet, and at this time we will point out any hazards or concerns we might have. Upon finalizing the adoption, you will need to sign an adoption contract that will be provided to you by one of our team members. Please note: Completing adoption application and home check does not guarantee placement of one of our rescued pets in to your home. We reserve the right to deny an adoption at any time. Also, adoptions do not work on a "first come, first served" basis. You will also agree to follow up visits, and we reserve the right to regain ownership of the adopted pet in the event the contract has been violated. 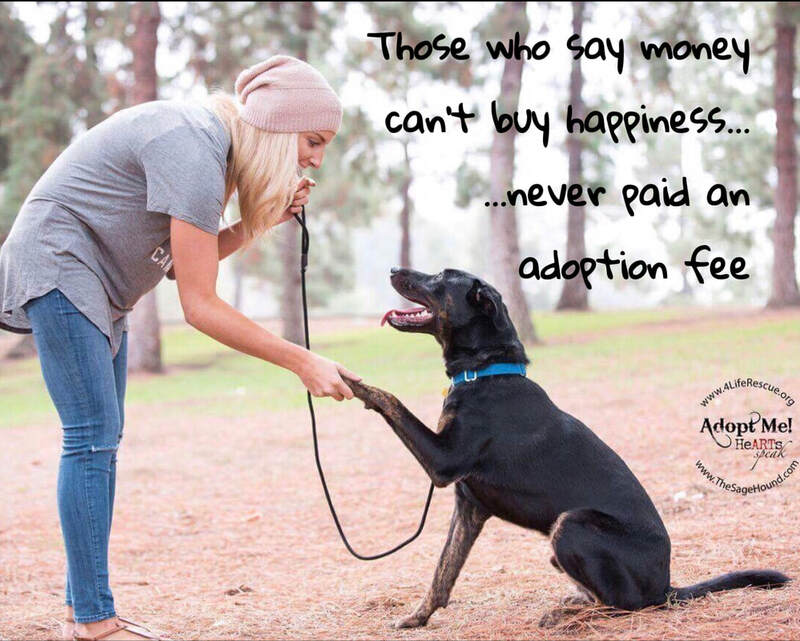 Upon finalizing the adoption, you will need to pay a non-negotiable adoption donation fee. WHAT IF MY CURRENT PET DOESN'T GET ALONG WITH THE NEW PET? When it comes time to bring a new animal into your home, we ask to meet the entire family, including all of the pets within the home. We will work hard to understand the needs of you and your family so that we know which type of pet will work best for you. We will assist with proper integration and will teach you the correct way to introduce your pets to the newcomer for a smooth transition into the home.​ Click Here to read a great article about introducing a new member to the pack. I LIVE OUT OF STATE. CAN I STILL ADOPT? Unfortunately, no. All adoptions must be local. This allows us to keep in contact with our adoptors should they need us. I LIVE IN AN APARTMENT. CAN I STILL ADOPT? Yes. But we will need to discuss any specific exercise needs for your dog. Some dogs have more exercise needs than others, and some dogs are just better suited for apartments than others. We will help you find a dog that is suitable to your living situation. If you are renting, we will also contact your landlord to be sure that your new pet is permitted. We may also confirm any weight, size, or breed restrictions. You need to be at least 21 years old in order to adopt. DO I NEED A FENCED-IN YARD? No. There may be some dogs that would require a fenced in yard under certain living situations or lifestyles, but this is generally not the case. We do strongly recommend that you always leash your dog when not in a contained area and that cats are always kept indoors. Leashing you dog is not only required by law, but your new pet is much more prone to wander off and lose its way home within the first few months in a new home. HOW CAN I MEET ONE OF YOUR AVAILABLE PETS? We hold adoption events throughout Orange County. Please visit our events page for event details and contact us at savealife@4liferescue.org to find out if the dog you are interested in will be attending the event. If you cannot make it to one of our events, please complete an adoption questionnaire and we will contact you within 48 hours. We require an adoption questionnaire in advance of private meet and greets. Please note: we do not bring our cats to adoption events. If you would like to meet one of our available cats, please contact us directly. On average it takes less than a week to complete every step of the process, but it could happen as quickly as one day! The process relies heavily on the your availability of our volunteers and any scheduling conflicts. We do not currently allow "foster-to-adopt" situations or pets being placed on hold. Please let us know if you have any questions about the pet you are interested that might help you make the best decision. We do our best to get to know each pet on an individual basis, so that we can fill you in on all of the details that may or may not work for your family. WHAT IF I have trouble with my pet after i adopt? ​Let us know as soon as possible. We are here to help, and the sooner we nip it in the bud, the better.